Are you looking to customize your letters with a pattern or design you found online? We now offer a super simple solution, and all you have to do is email an image. To add a pattern to your letters simply choose "your own pattern" in the foreground color drop-down menu. 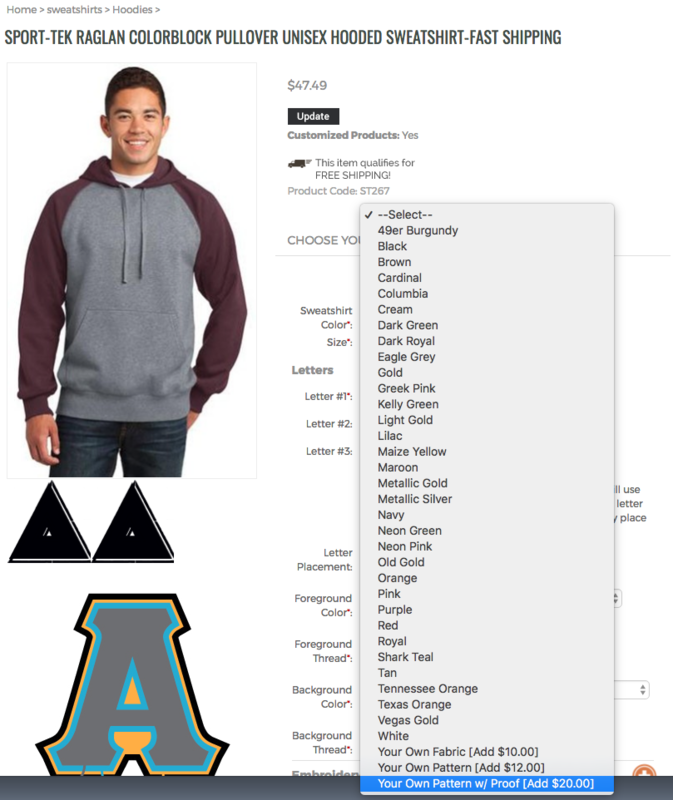 It is the last two color option in the list. If you want to see a preview of your pattern on your letters choose "your own pattern w/ proof"
Ordering for a group? We provide complimentary proofs on orders of 5 or more pieces. NOTE : WE CANNOT USE OR REPRODUCE COPYRIGHTED IMAGES OR LOGOS, PLEASE DO NOT SUBMIT BRANDED PATTERNS. YOU CAN SEND YOUR OWN BRANDED FABRIC USING THE YOUR OWN FABRIC OPTION. Once you have decided to use a pattern image use this helpful tip on finding and sending a quality image or pattern for your Provide Your Own Pattern Image Letters. When searching Google for images use the tools to search for higher resolution images, you can select images larger than 2 MP, these images would result in a more crisp print on your letters. Some images are too small to print altogether, so always try and find the largest file possible. Once you have selected your pattern image, please download the file and email it to info@greeklifethreads.com with your order number. You may request a proof for Your Own Pattern after the order is placed for an additional $8 per proof. We allow up to 3 revisions per proofed set of letters. For group orders of 5 or more, please request your proof when submitting your pattern. We do not create proofs unless specifically requested. We cannot modify or change the pattern images, this includes but is not limited to, changing colors, changing design elements, removing or adding design elements, and rendering or drawing new patterns.